November 25, 2018 – Washington, D.C. – On this day in 1943, over two hundred delegates from all across Bosnia and Herzegovina (BiH) came together in a town called Mrkonjic Grad and formed the Anti-Fascist Council for the National Liberation of Bosnia and Herzegovina (ZAVNOBiH), restoring the statehood of BiH, and declaring it a country that belongs neither to Muslims, Croats or Serbs, but one of equal rights for all of its citizens. The current BiH constitution, otherwise known as the Dayton Peace Accords, is a peace agreement that was reached at the Wright-Patterson Air Force base near Dayton, Ohio in November of 1995. Dayton Peace Accords ended the war of aggression against BiH, however, it was by no means a flawless agreement. For instance, it violates the European Convention on Human Rights for not allowing ethnic minorities to run for the tripartite Presidency and the House of Peoples. To date, no concrete steps have been taken to implement this judgment by the European Court of Human Rights. At a time when the leadership of BiH’s smaller entity Republika Srpska (RS) is threatening secession of RS, which would inevitably lead to another war, ACBH calls on all friends of BiH to join us in working towards safeguarding BiH’s sovereignty, security and territorial integrity, and continue to stand for what ZAVNOBiH achieved and implemented seventy five years ago. What remains true to this day is that BiH’s strength lies in its people and its centuries-old, multi-ethnic fabric. Today, ACBH celebrates BiH’s Statehood Day and the efforts of the founding members of ZAVNOBiH with hope that the citizens of BiH will continue to work diligently at eliminating artificial separatism and creating a prosperous BiH that is a member of NATO and the EU. 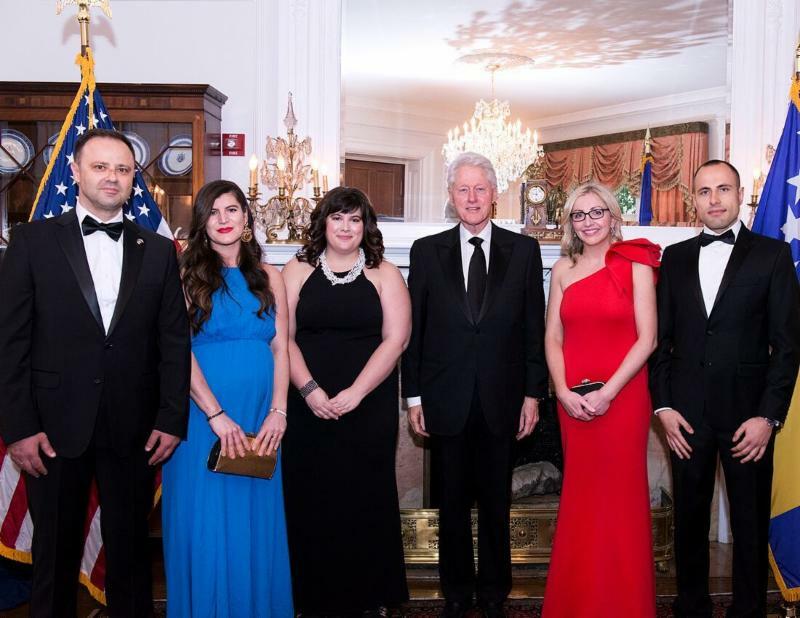 This year, ACBH together with friends of BiH gathered in Washington, D.C. at ACBH’s annual gala and paid tribute to those who have sacrificed and dedicated their lives for Bosnian statehood. “Bosnia regained its statehood in 1943 as a country with one of the strongest, if not the strongest, anti-fascist movements in Nazi-occupied Europe. Our statehood was reborn through bloody struggle of Bosnians of all political persuasions within the People’s Liberation Movement led by Tito. One of the greatest achievements of Bosnian nation is that we were one of the very few nations in Europe not to be liberated from Nazism by the Allied forces. We liberated ourselves. Again, in the 1990s we managed to defend ourselves against overwhelming odds. However, I believe that the lowest common denominator of Bosnian history is tolerance of the other. That is why I believe that us Bosnians became such good and proud Americans today,” stated ACBH President Ajla Delkic. ACBH also honored General Wesley Clark, Ret., with an ACBH Outstanding Military Service Award for his valor, and contribution to BiH’s peace and stability. As the former NATO supreme allied commander, General Clark is one of the most decorated military heroes of our time who helped achieve the peace agreement that still endures to this day in BiH in the Dayton Peace Accords. The ACBH Philanthropy Award was presented to Bosnian entrepreneur and humanitarian Sanela Diana Jenkins. As one of the most successful and recognizable Bosnians, Ms. Jenkins has dedicated a lot of time and resources to the advancement of justice and BiH’s progress and development. Next, ACBH honored General Gordon R. Sullivan, Ret., with the ACBH Lifetime Achievement Award for his role in helping build a better and safer world with the elimination of landmines through his non-profit organization, The Marshall Legacy Institute (MLI). General Sullivan served as the 32nd Chief of Staff of the U.S. Army and a member of the Joint Chiefs of Staff. 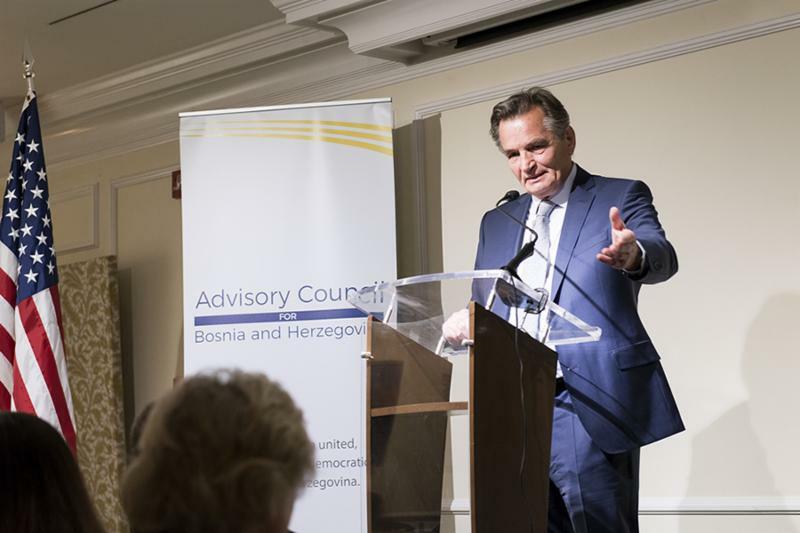 The ACBH Bosnia and Herzegovina Friendship Award was presented to longstanding friend of BiH and Bosnian Americans, filmmaker and author Bill Carterfor his tireless commitment to human rights and the brave humanitarian actions that he undertook during the war in BiH. ACBH honored U.S. Army Captain Ermin Mujezinovic with the ACBH Public Service Award for his selfless service to our nation. Next, ACBH was proud to honor the Hastor Foundation with the ACBH Community Service Award. Set up by the family Hastor, this charitable organization supports and empowers 1860 children and young people in over 115 municipalities in BiH. As we celebrate the 75th anniversary of BiH’s statehood today, let us be reminded that throughout history, BiH has been a country of unity, tolerance, and a safe haven for multi-ethnicity, and ACBH is dedicated to upholding those principles today, and always.